ALLO - VOLT AMP - Audio Amplifier Overview: The TPA3118 class D amplifier IC is a leap in term..
ALLO - VOLT+ AMP - Stand Alone Audio Amplifier Overview: The TPA3118 class D amplifier IC is a..
ALLO - Volt+Amp + Stepped Attenuator Overview: This is the VOLT Plus + Stepped Attenuator. Inc..
Allo-Volt+D(Double)-2X60w Overview: A class D amplifier that is really HIFI. We changed every ..
DAC - Elvee's Circlophone© - Power Amplifier Overview: Circlophone© is a ne..
Dayton Audio - KAB-INT Interface Extension Board for Bluetooth Amplifier Boards Overview: ..
Dayton Audio - KAB-250 - 2x50W Class D Audio Amplifier Board with Bluetooth 4.0 Overview: The ..
Dayton Audio - KAB-FC - Functional Cables Package for Bluetooth Amplifier Boards Overview: The.. Eight Audio - EAAM05 - TDA 7294 200 Watts Stereo / Bridge Amplifier Overview: EAAM05 Stereo / .. Eight Audio - EAAM10 - 2 X 32watts TDA2050 Chip Stereo Power Amplifier With On Board PSU Overview.. 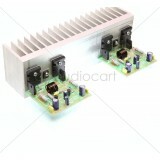 Eight Audio - EADA04 - 1x100W 2 Ohm TPA3116 Class D Audio Amplifier Board Overview: Welcome to.. Eight Audio - EASP186 - LM3886 68W Power AMP - Mono Overview: This gainclone amplifier uses a ..
Lumin - 100 Watts MOSFET Power AMP Mono Features: Output device IRF150 MOSFET Compa..
Megatek - 200W Mono (2SA1943 / 2SC5200) Power Amplifier W/o Heat sink Overview: 2SC5200/2SA194..
Megatek - AE216008 - 120W STK 4141 Stereo Power AMP with built-in Transistor Tone Control Overvie.. Octave 1 - 100W Hi-Fi Power Amplifier - Mono Overview: This is a hi-fi mono audio power amplif.. Octave 1 - Power Amplifier LM3886 - 120W Stereo Standard Overview: This power amplifier PCB us..